When it comes to exercise bikes, you have 3 distinct types. These are the Spin bike, the recumbent exercise bike, and the upright exercise bike. While they all offer a great way to get a riding workout, each will work in a slightly different way to the other. So if you are wondering about the difference between the spin bike and the exercise bike, which is better? Then this article should help you discover the answer. As each one will offer up a different riding workout, there will be advantages and disadvantages depending on your desired fitness goals. While there are differences between them, there is one feature that is the same and that is that they are all a type of exercise bike. Regardless of the variation you choose, you will be seated on a saddle and manually peddle as part of your workout routine. The main benefit is that you receive a great cardio session which will help tone and condition your legs and lower torso. All 3 bikes will allow you to adjust the intensity of your workout session, and each of them will help you to improve your general fitness while burning off plenty of calories in the process. Ultimately, this will result in healthy and gradual weight loss. So, if you are looking for info regarding the spin bike vs exercise bike for weight loss, then below you will find out all that you could possibly need to know. If you are ready, we will begin with the spin bike. It was during the 1980’s that the spin bike was first introduced to the health and fitness market. It holds similarities to riding an actual bicycle outdoors and is commonly used by those who enjoy cycling to get in a great workout, regardless of the weather or location. Also, it is a popular choice among those looking at improving their general health and well being. The way in which a spin bike is used is pretty much the same as being seated on a racing bike. You position yourself on the saddle and extend your arms and upper body forward to hold on to the handlebars. As you begin to peddle, the front wheel will begin to rotate, this is quite a heavy wheel and provides resistance much in the same way as an outdoor bike would. When you cease peddling, they continue to spin as the weight of the wheel keeps them in motion, thus keeping you moving even when slowing down. You are also able to stand up when peddling with extreme resistance. This is the same action that you would perform when riding up a steep incline, such as a hill or a steep road. Typically, there are not many fancy additions to a spin bike other than the LCD screen, which informs you of your speed, distance, calories, and heart rate. It is common to find spin bikes in a gym, where they are used for group workouts to intense routines and upbeat music. With this type of bike, you will first notice that it consists of a large, well-padded seat which is much the same as a high-backed chair. The peddles of the bike will be placed in front of you when sitting, so you have to extend your legs to reach them as if riding in a paddle boat at a water park. This can feel a bit strange at first, mainly because of the position of your legs and abdomen during use. However, it is a great choice for those with back and lower body mobility issues and help them to receive a great conditioning workout. This bike is different to the spin bike in the way that when you stop peddling, they will no longer rotate. The bike consists of a magnetic resistance system, which can be quickly adjusted via the bike control board. This control board will consist of plenty of programs and data, which allows you to fully monitor your workout and reach your fitness goals. While this type of bike allows for a great workout, you will be using much less of your body’s muscles while riding. Primarily, it will work on your upper legs, buttocks, and calf muscles while eliminating any other pressure placed on other parts of the body. Of the 3 types of bike, the recumbent bike is the largest, mainly down to the fact that it features a large seat and the position you will be sitting in when working out. This is something to consider when you have limited space. You will also need to place it near a wall socket to power the program board and LCD system. You will burn fewer calories on this type of bike and work out fewer muscles than compared to a spin bike. Of all 3 types of bikes, the upright is the most utilized one. The saddle and handlebars are very similar to a traditional outdoor bike, but the bars are positioned at a higher level. This means that you will be positioned in an upright stature when using it. You will also notice that the saddle is much more comfortable than a traditional bike. You will find the riding experience to be the most comfortable of the 3 due to the natural position you will adopt when riding. As with the recumbent bike, when you stop peddling, everything else stops too. You have a choice of resistance and training modes available to you, along with all of the important health information, such as calories, speed, incline, heart rate, etc. 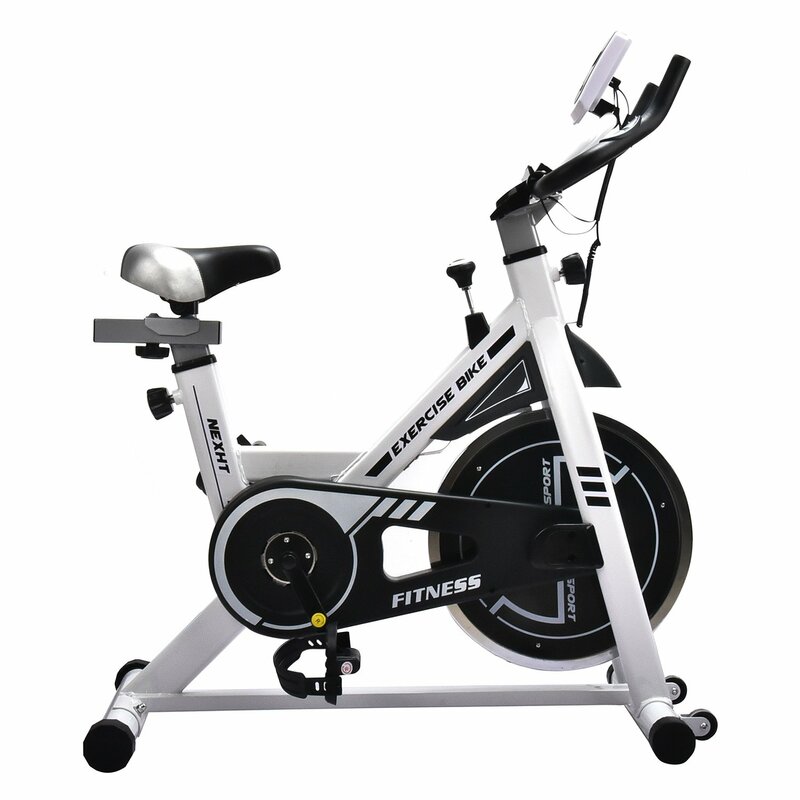 You will also find that this bike will also provide the best allover workout, especially as it makes use of the muscles in the abdominal area, the back, and the legs. Working out these core muscles helps develop tone and strength and as they are large muscle groups used for stability, you will burn many more calories. They are also easy to fold away and put into a cupboard out of the way, which is great if you have limited space at home. The spin bike will provide an amazing cardio workout and burn an average of 250 calories per hour at a leisurely pace, or 700 calories at a pace of roughly 14 MPH. The recumbent exercise bike will burn 180 calories per hour at a leisurely pace, and 450 calories per hour at 14 MPH. Lastly, the upright bike will burn 310 calories per hour at a leisurely pace, and 850 calories per hour at 14 MPH. So, the best bike for weight loss is the upright exercise bike, which is followed closely behind by the spin bike, and then lastly the recumbent exercise bike. Each will suit different body conditions, health issues, and end targets, so the bike you choose will depend on these factors.